Fortunately for those who are creatively inclined, the creative process doesn’t always depend on tools, instruments or art supplies. But they certainly help! You’ll be hard pressed to paint a landscape without, you know, paint; writing a novel would still involve paper and ink if it weren’t for the invention of the printing press; and where would we be without the internet? Answer: literally nowhere. These inventions (and the ones featured in the roundup below) have so profoundly influenced creativity that certain mediums wouldn’t even be possible without them. Moreover, they’ve opened up artists to new potential, made us more creative as a species — and basically completely changed the scope of art history in the process. While pinhole cameras have been rudimentarily used for centuries, the first commercial camera, called a daguerreotype after its inventor Louis Daguerre, was built by Alphonse Giroux in 1839. This nifty camera used a double box with a landscape lense, and was able to focus on objects at various distances with exposure time taking between 5 and 30 minutes. Thanks to the camera’s invention, people were able to document the world around them, take photos of their loved ones, and ultimately experiment with new artistic media. Oil painting (the combination of pigment and oil) has been traced to 650 AD paintings in Afghanistan, but it was also discovered and popularized by painters in 15th century Netherlands. Thanks to their prolific use of oil, these paints became the most common medium in 16th century Europe (replacing tempera). Had oil pants not been invented, some of the world’s most famous paintings may never have been painted –– including the Mona Lisa. 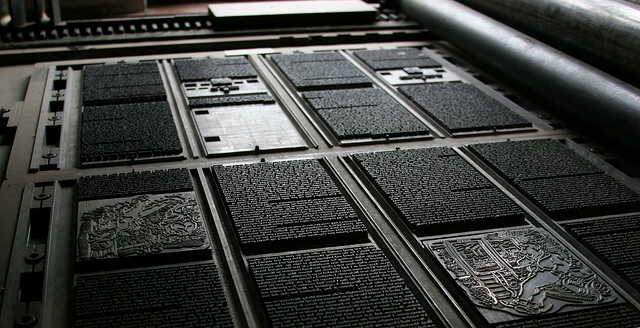 The invention of Johannes Gutenberg’s printing press in 1450 made possible the mass production of books. Before Gutenberg’s press, and movable type technology in general, novels were painstakingly transcribed by hand or block print. The press’ invention opened the floodgates for novelists, writers, philosophers and essayists to publish their work at rapid speed. We know what you’re thinking: cement is deeply boring and why is it on this list. But the invention of cement in Mesopotamia and Rome made architectural history. Thanks to cement, the Romans built the Pantheon and Baths of Caracalla, as well as their world-famous aqueducts. The seemingly innocuous building material birthed a new era of creativity and architecture, and allowed structurally complicated buildings to be feasible. The sewing machine was invented in 1790 by Thomas Saint (though it was remodeled, improved and perfected by various inventors in years following), and its advent dramatically changed the textile industry. Not only did the sewing machine allow clothes to be made at a more rapid pace, it allowed people to design their own garments with ease, and paved the way for the fashion industry’s development. Camcorders are less of an invention (the technology was already there!) and more a brilliant campaign for creativity. Thanks to inexpensive home movie devices and simple editing programs, anyone can easily make their own rudimentary movie and post it to YouTube. Give a creative kid a camcorder, and he might grow up to be the next Benh Zeitlan. Does Writing By Hand Make You More Creative?